Carrot cupcakes are a classic and pretty much a guaranteed cupcake success story. 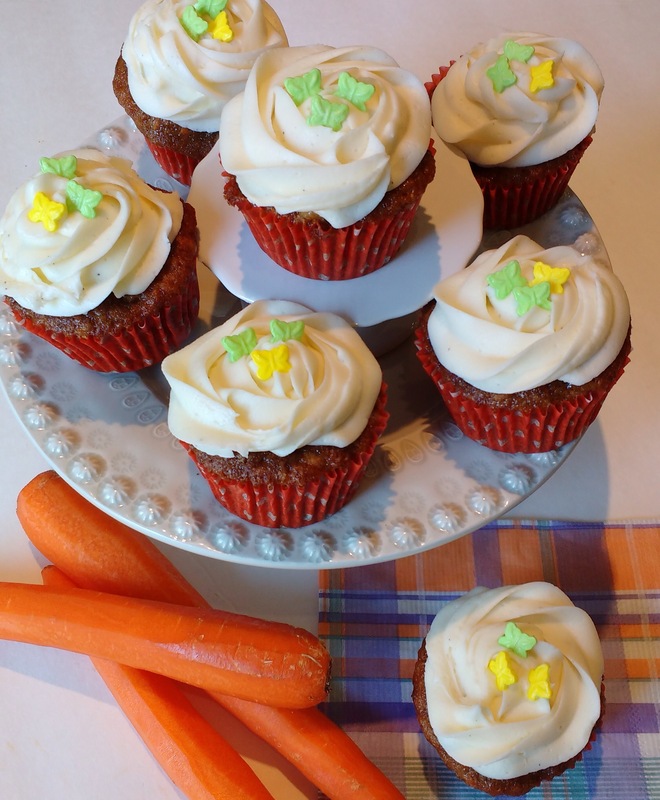 With the addition of grated carrots which add depth of flavour as well as moistness to the cupcake plus the tangy sweet combination of cream cheese, butter and icing sugar mixed together to top them off they are a hit! Carrot Cupcakes w Cteam Cheese Icing. Top these with Cteam Cheese Icing for the traditional combination or with a buttercream icing if you prefer. These will freeze well with or without the icing. Let’s not forget with the addition of the grated carrots I’m sure these babies must count toward my daily veggie serving! Preheat oven to 350F. Grease or line a 12-cup muffin tin. In a medium bowl whisk together the flour, baking soda, baking powder, salt, cinnamon and nutmeg. Set aside. In a large bowl, whisk together the sugars and then whisk in the eggs. Add in applesauce and vanilla and mix together. Add in the vegetable oil and mix until combined. Spoon batter into muffin cups filling about 3/4 full and bake for approximately 18-20 minutes until tops spring back lightly when touched or a toothpick inserted in centre comes out clean. Beat together 1/2 cup room temperature butter with 1/2 cup room temperature cream cheese. Add in approximately 3-4 cups icing sugar and combine on low speed. Add in enough icing sugar to have a spreadable consistency. Add in 1 teaspoon vanilla and mix well. 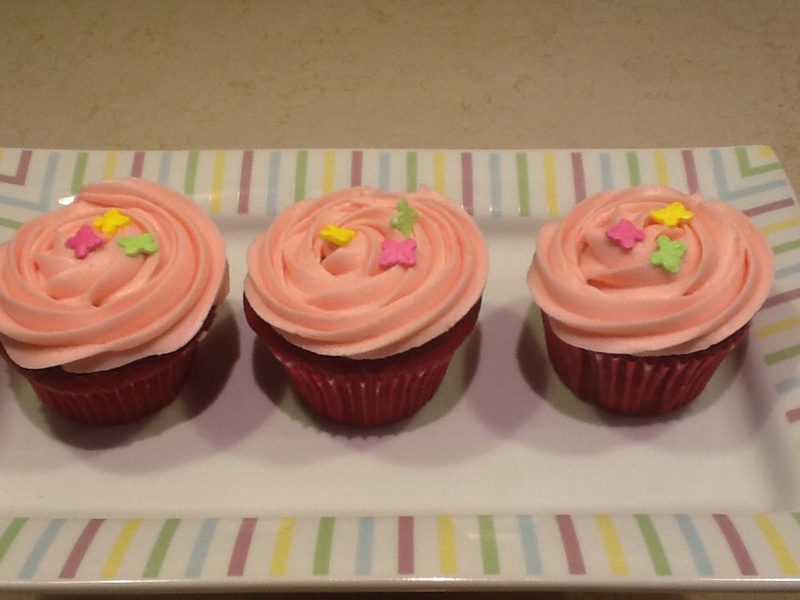 Use a knife or piping bag to ice the cupcakes. In the last 2 days I have baked up about 50 cupcakes. Half I iced with a yummy buttery icing and the other half of the cupcakes I morphed the remaining icing into cream cheese icing by adding about 6 ounces of cream cheese a little more icing sugar and a little more whipping cream. Tint any colour you like and look how pretty they are. Great for any celebration or occasion. For the buttery icing beat 1 cup room temperature butter for about 5 minutes on medium-high speed. Turn beaters off and add about 4-5 cups of icing sugar and beat it in on low. Add in about 1 tablespoon of vanilla and about 1/4 cup of cream or whipping cream. Beat on medium until well mixed then beat on high for about 5 minutes. Add in cream and or icing sugar as required until light and fluffy.